Last month, I had the wonderful opportunity to guest design for My Creative Scrapbook. 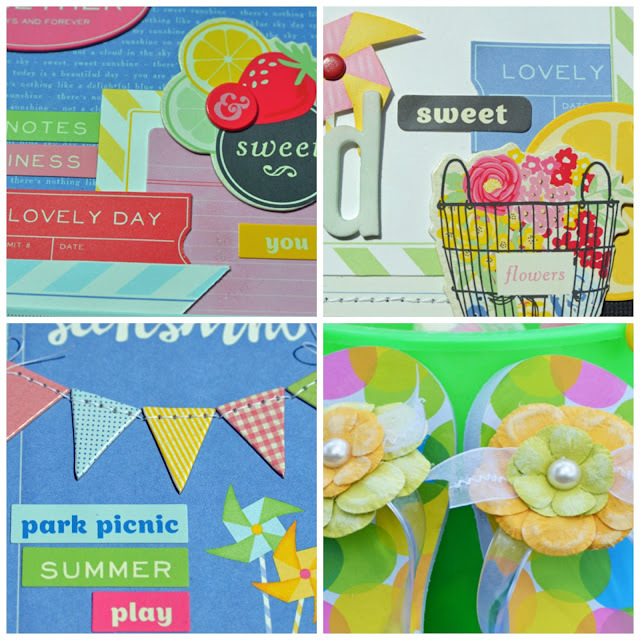 You can see the layouts and altered project I did with May's main kit here, here, here and here. The exciting news is, Pam (the owner) asked me to join the design team so you'll be seeing more work from me using her beautiful kits. This month I worked with not only the main kit, but the creative kit too. Starting tomorrow I'll be revealing my projects (and the kits themselves). The first is an easy end-of-the-year teacher gift idea you don't want to miss. Enjoy your day! can't wait to see them. love the EP chipboard! Wooooooooooo hooooooooooooo!! CONGRATS!!! LOVING the kits and love love love your sneaks!!!! Can't wait to see them in full!! Super huge congrats and well deserved!!!! Love the kit too! So excited for you! Have a blessed day! Congrats! Loving all the summery colors I see! Congrats - what fun colors!! Can't wait to see what you do with them. huge congrats lisa- this kit looks amazing! is this the same scrap kit that izzy is on the dt? oh my you are going to be awesome and i love the look of this kit! Congratulations on the new assignment. The sneaks look awesome. Congratulations!!!! The New Kit Looks Great And So Do Your Sneaks! Congrats on joining the Team Lisa! You did a wonderful job with the Kit during your Guest Spot!! a BIG congrats Lisa !!!! The kits look so full of crafty stuff that you will make beautiful layouts from:):) I just know it!!! Congratulations! Love all the wonderful summer colors in this kit. Look forward to seeing all of your projects. Yay! Way to go Lisa! Congratulations, that's so exciting! :) Can't wait to see some of these projects!